Green carpet of super bike sharrows – a new type of bike lane? 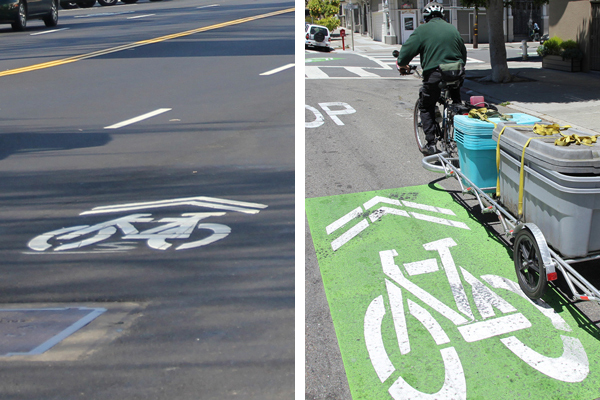 Bike sharrow (left) and super bike sharrow (right). Are bike sharrows becoming more common? I never did like bike sharrows on wide streets that have more than two lanes in any city. I have seen them a lot where the roads have no space for bike lanes. Then not too long ago, I started seeing green-backed bike sharrows, called super sharrows which can be spotted on the Wiggle and Market Street in San Francisco. Now they have taken it up another notch with these carpets of green super sharrows in Long Beach, Salt Lake City, and recently in Oakland. It just reminds me of vehicular cycling (where you ride your bike like a motorist) which has failed miserably to get more people to bike. I hope this doesn’t become a norm. 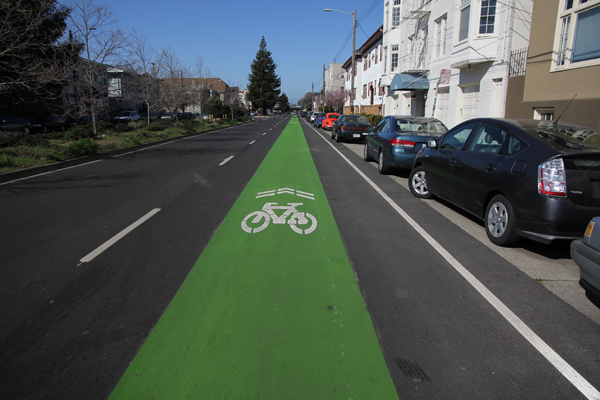 Green sharrow bike path on 40th St. in Oakland, CA. Does it make you want to ride on it? 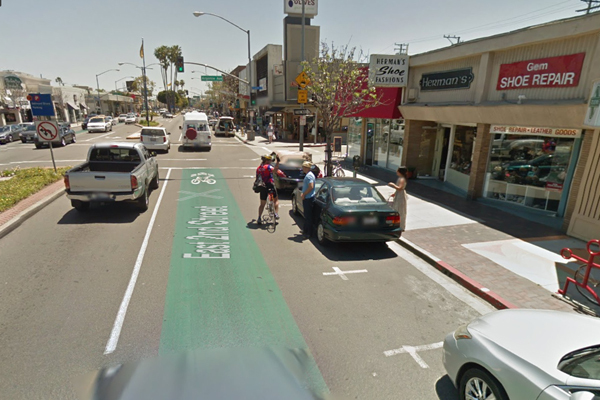 We went to Long Beach in 2012 to check out their bike infrastructure and we experienced this type of bikeway. We didn’t like it at first. I thought it was stupid because again, bicyclists have to share a lane with drivers and it seemed like having green paint there was supposed to trick cyclists into thinking they have the lane. After some analysis, I understand now why they did this. The auto traffic through there moved slow at around 8-15 mph (12.9-24 kmh) which is bike speed, with many traffic lights on 2nd St. and it’s on a commercial corridor. In this situation, this type of bikeway may work better than a conventional bike lane because you are away from car door zone. 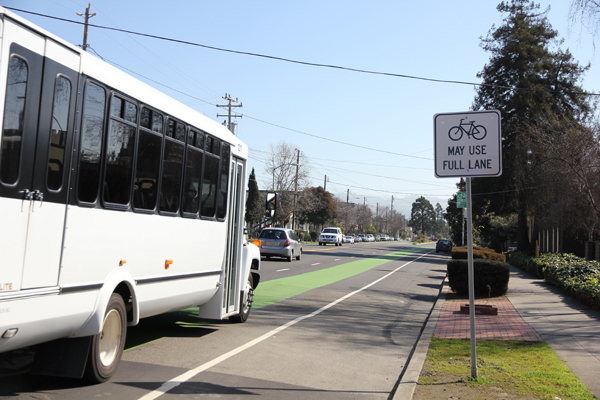 You won’t have to swerve out of the bike lane because of idling cars blocking it, and you can avoid right hooks at intersections. 2nd St. commercial corridor in Long Beach, CA. Notice numerous shops and traffic lights. However, I think that the one on Oakland’s 40th St. is a bad idea. I did not feel safe at all going through there because motorists were going as fast as 40 mph (64.4 kmh). You can hear the roaring engine noise from trucks coming from behind, and cars passing you to change into your lane at 3 times your speed and merge into your right of way at any time. I felt vulnerable. Maybe during commute times things may be different (I was there on a late Sunday afternoon and very few cyclists were on it). Still, I can never trust distracted or angry drivers and I see plenty of them on the streets at all hours. Also, if adding a protected bike lane was going to be so expensive (again, the green sharrow lanes that are there now are a compromise between protected bike lanes and none at all), I don’t understand why street parking couldn’t have been removed to create a buffered bike lane instead, which is cheaper and easier to do. Since this is a residential area with homes that have garages and it is not a commercial area with shops, they do not need the parking. Also, adding a buffered bike lane wouldn’t impede traffic flow. Note the lack of traffic lights and the long distances between intersections. That type of environment does not allow for the safe mixing of bikes and cars. There should have been a buffered bike lane instead. 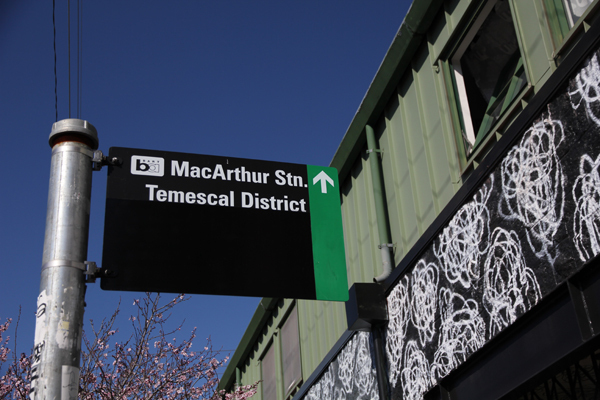 Fortunately, according to this EastBayExpress.com article, this will not be the final design for that street and this is a pilot study. I hope it will not be permanent.